So this week I reached 500 subscribers on my youtube channel!!!! Unfortunately I also happen to have the flu this week which is why there has been no activity from me, but I am hoping to be back to regular uploads/blog posts on Monday, so till then I suppose you have to be happy with this little giveaway lol. 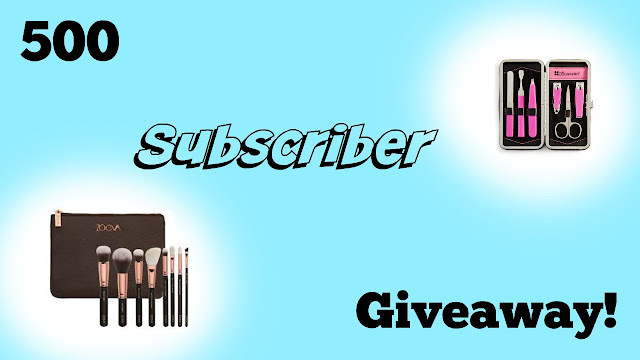 I am giving away 4 BH Cosmetics Quilted Manicure Palette, and 1 Zoeva Rose Golden Luxury Set! The manicure palettes are already here and ready to go out to their new homes, the brush set will be shipped directly from the company to the winner, the reason for that is the shipping is a flat fee of $16 and thento ship from Hawaii to the use it would be an additional $10, so to be frank its cheaper lol. Here is the app to enter with, the only mandatory thing here is you must be a subscriber, everything else is optional. The winners will be announced on July 19, 2015 so you all have 1 month to try and get as many entries in as possible…Good luck and thank you guys so much for supporting me.